Last night was a big one for the NBA, and we're not talking about Michael Rapaport's MVP performance at the All-Star Celebrity Game. For the first time in Olympic history, an NBA player lit the Olympic cauldron. 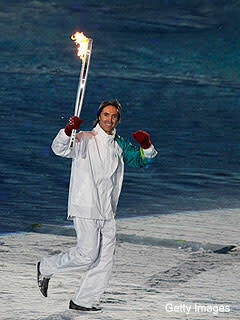 We knew that Steve Nash would carry the torch, but actually light the flame? That's big time. Among Canadian legends Wayne Gretzky, Catriona LeMay Doan, and Nancy Greene, Nash's participation in the Opening Ceremony affirmed Canada's acceptance and embrace of basketball. That's quite a big step from the last NBA experience in Vancouver. While the 1995 NBA expansion into Canada has been quite successful in Toronto, the same can't be said for Vancouver. Players refused to play for the team, attendance was sparse, millions of dollars were lost on a yearly basis, and the best result in a season was not finishing last in 1998. No matter how you slice it, the Grizzlies' run in Vancouver was a disaster. As such, the franchise was moved to Memphis, Tennessee, in the summer of 2001. Almost nine years later, that catastrophe was rendered irrelevant by Steve Nash. As the two-time NBA MVP took the Olympic flame and passed it along, it was Canada's way of saying "basketball is big here." By casting Nash as an equal to the country's sports heroes, Canadian organizers elevated the basketball player to that level, despite Nash's irrelevance to the Winter Olympics. Yes, Nash is a British Columbia native, and he has captained the men's basketball team during the Summer Olympics. But this honor wasn't bestowed upon him because of those things. He was chosen because he's one of Canada's greatest athletes, regardless of sport. And for the first time ever, a professional basketball player was offered as a national legend of the highest order. That's an amazing thing no matter where you're from.